Flying insects that will establish on leaves or flowers giving birth to live young that quickly colonise the plant. Usually easily visible and as they moult their shed skins fall onto lower leaves.Some aphids excrete honeydew that leaves a sticky sugar solution on the leaves. They may also cause stunting and twisting of leaves. 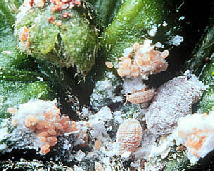 Very small mites live on the underside of leaves feeding on the sap of the plants. Symptoms are yellow speckling on the leaves and a silvery appearance to the underneath. Followed by fine webbing between leaves as it gets worse. The mites like hot, dry conditions so keeping the air humid will reduce outbreaks. If you look through a magnifying glass you may see small red or green spiders moving across the leaves. Cotton wool like growths appear in the axils of the leaves, flowers and stems. The insect lays it’s eggs inside this protective wax which protects them from sprays and predators. 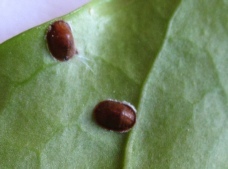 When the eggs hatch the larvae move around the plant. This is when they are most vulnerable. They produce honeydew which may lead to sooty moulds. A common treatment is Methylated spirits – dip cotton wool in solution and wipe over leaves and in leaf joints. Small brown hard ‘lumps’ appear on the leaves of the plants, a few at first but multiplying rapidly. There are several types of scale which are all slightly different. These scales cover the female insect and she lays her eggs underneath to protect them. 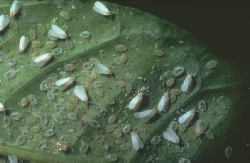 When the eggs hatch you will see small insects crawling away from the scale, at this point they are most vulnerable. Use Methylated spirits as for mealy bug. Small white flying insects that infest the shoots and leaves. If disturbed clouds of very small mothlike adults will fly away. 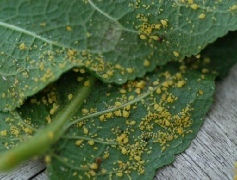 Young whitefly larvae ‘scales’ live on the undersides of the leaves and produce honeydew on which black sooty mould grows. Try hanging yellow sticky traps around plants to catch the flying adults.